Anthony slept until 5:50 — getting much better! We all went for a walk toward the temples, but it started to rain lightly not long after leaving, so we cut the trip short. One of the temples has a huge wooden gate. A neighboring temple is known for its cherry-blossom viewing, but that season has passed (although Fumie and I visited it a few years ago). 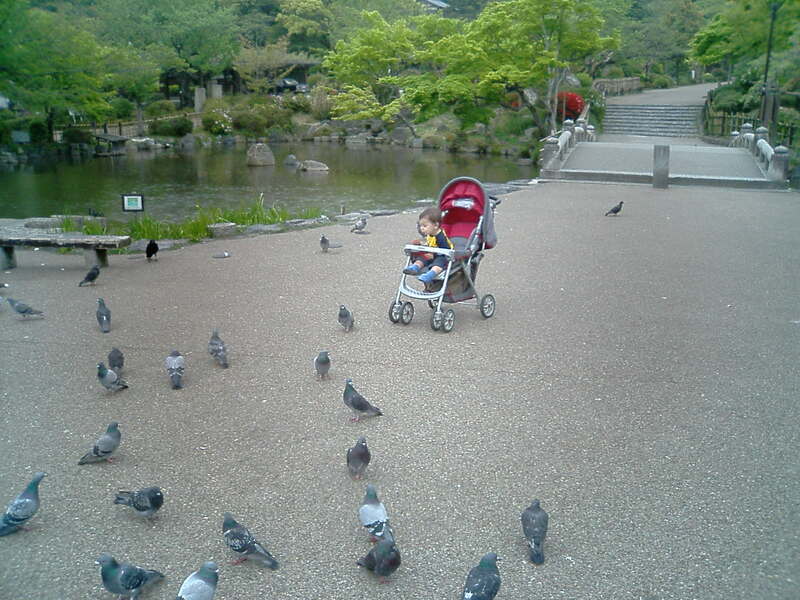 Still, it offers a lot to someone like Anthony — he loves the birds. Fumie needed to go to the bank to take care of a number of things, so we all went together and dropped her off, and then the three of us (Mom, Anthony, and I) continued on to a recently-opened Jusco mall on Gojou street, in the Saiin area of Kyoto. Half of the ground floor of this mall is a supermarket / department store, and while walking through the supermarket, I was awe struck. I've never seen a larger, cleaner, brighter, well stocked supermarket in my life. The coolers of cartons of milk and juice and teas were packed 20 deep, and all in perfect alignment. They must have staff on hand to immediately swoop in and replace a product that a customer has bought. It was the most amazing display of the bounty of a free, capitalist society that I've ever seen. The rest of the place (a total of three floors) continued along the same line. Every store was super neat and clean and well presented. In the food area, things were displayed in a very inviting way. one juice/smoothy type shop had display of a dozen or so different blenders, each filled with a different colored smoothy. Very inviting. I should have taken a picture of it, but I was too in awe of the whole place, and also, under somewhat of a time constraint, since we had only 45 min in the whole place before we had to leave to return home in time for the air conditioners to be installed. We bought some veggies from a grocery (again, everything displayed in perfect neatness and order), and some lunch from a bento shop. The first two hours of parking were free, so that was cool. We made it back right at noon (the start of the delivery window), but it turns out that they didn't arrive for a while. When the guy came, I showed him the locations – we had four units, in three different sizes, going into four locations. Each unit is made up of two parts – a wall-mount heater/blower, and an outside-mounted compressor. While showing where the dining-room unit would go, I commented (incorrectly, it turns out) that this is where the larger one would go. 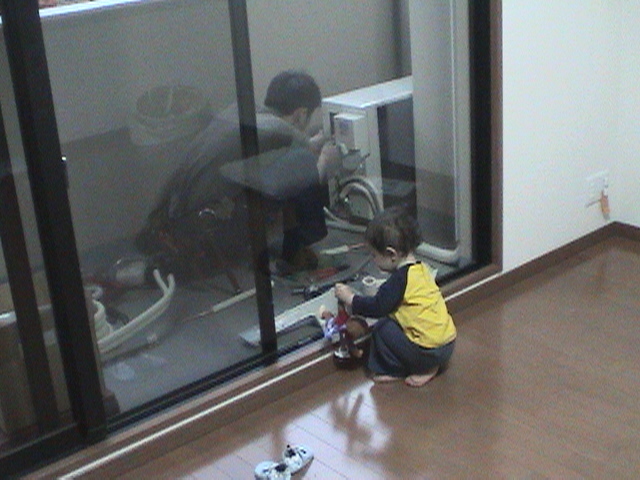 He installed the wall part of the living room unit. This involved hooking up four hoses (probably a coolant in and out, a drain, and one that I don't know what it's for), a high-voltage electric line, and a low-voltage electric line. All of these run as a bundle through a hole in the wall, out to the compressor. He got all that installed (so that they at least got outside), then moved to install the wall unit for the dining room. While in the process of trying to get the mounting bracket to fit on the inconveniently-sized pre-installed mounting bolts (the wall where this one is to be installed is concrete with wallpaper over it), I was absent-mindedly leafing through the work-order papers when I came across a map of the apartment that showed that the larger unit would go in the living room, not the dining room as I'd said. He'd already installed the middle size there, so oops, my mistake. Still, he was kind enough to fix my mistake (added 30 minutes or so to his work). Fumie would have killed me if I'd had them installed in the wrong spot. Thankfully, she was out with Mom and Anthony (Anthony got fussy as soon as the workman arrived, since he wanted to be in on all the action, but was being held back). Eventually, they came home, and Anthony enjoyed watching the workman. He was here for quite some time — he left at 7ish or so, having gotten a bit more than half way done. We did have two working units (living room and dining room), but had no need for them this evening.